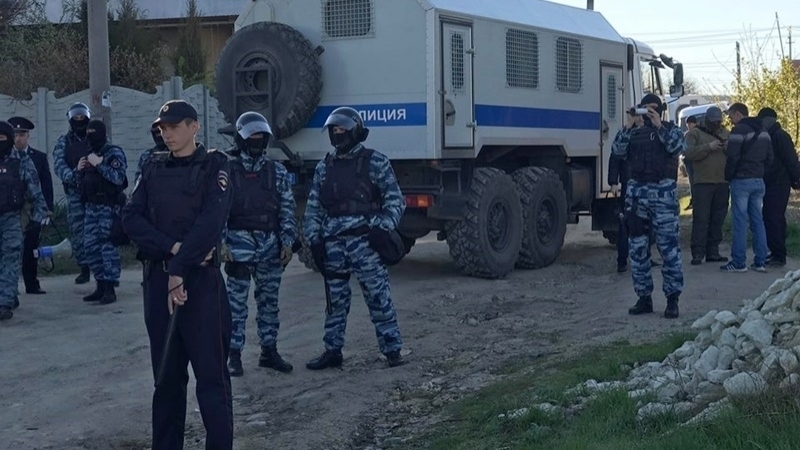 October 11, occupants have been massively conducting searches and detentions in the homes of Crimean Tatars in Bakhchysarai since the early morning. Near the house of Suleiman Asanov who is being searched today, FSB detained his father - 62-year-old Refat Asanov, his brother Elnur Asanov, a relative Ernest Ibrahimov, as well as neighbors Rudem Nedzhiev and Eldar Asanov. At the moment, the detainees are waiting for lawyers in the Bakhchysarai District Police Department, according to the QHA sources in the Crimea. The source further reports that Alimdar Belyalov, an activist from the Stary Krym, as well as Ahmad Suleymanov, were detained near the house of Seyran Saliev. Later it became known that the search still continues in the house of Ernest Ametov. The occupiers took away Memet Belyalov, whose house is also searched (he lives next to Suleiman Asanov). “Memet Belyalov was taken away. Now, Timur Ibragimov must be taken as well. There is still no information on others, the searches still continue. Presumably, they are taken "under the old scheme" to Simferopol," the coordinator of the Crimean Solidarity Dilyaver Memetov said, according to "Crimea. Realii". The security forces took away Seyran Saliev and Timur Ibragimov. It also became known that the security officials went to the home of Timur Ibragimov's parents. “You are searching for the weapons which are in our hearts and in our prayers.11/10/17,” Mumine Salieva wrote on Facebook, attaching a photos of the search. In the apartment of Timur Ibragimov at 14, Mira Street, everything was turned upside down in search of literature (not weapons). Timur brought his wife from the hospital 3 days ago. During the search, a 10-day-old child was in the house. Outside the house of Timur Ibragimov, the security officials detained two streamers - Amet Suleymanov and Alimdar Belyalov. Furthermore, during the search in the house at 14 Mira Street, 60-year-old Eskender-aga Lumanov was also taken away . A member of the Mejlis of the Crimean Tatar people Eskander Beriev noted on Facebook that the searches are carried out in a particularly rigid form with the engagement of drones and jamming the Internet signal. Moreover, all those who have been searched have children: Suleiman Asanov (4 children), Zekiryaev Server (12 children, there is a newborn in the house), Seyran Saliev (4 children), Memet Belyalov (1 child), Timur Ibragimov (4 children, in the house there is a newborn child). “Today's searches are another evidence that Russian invaders are trying to turn Crimean Tatars into Islamic terrorists. Thus, they are trying to produce a picture that the Crimean Tatars are Islamic terrorists who can pose a threat to society," member of the Mejlis Eskender Bariev stated. First Deputy Chairman of the Mejlis of the Crimean Tatar people Nariman Dzhelal noted that most Crimean Tatars who openly showed their civil position were detained. “I want to draw your attention to the fact that today in Bakhchysarai searches were carried out and mainly those Crimean Tatars were detained who openly demonstrated their civil position, supported people in similar searches, participated in the work of the "Crimean Solidarity", etc. The authorities continue to muzzle the dissenting ones,” he wrote on Facebook. Memet Belyalov (who lives in the street next to Suleiman Asanov).